Passionate about the farming industry and have been in consultancy in Devon and Cornwall for 30 years offering both technical and financial advice to the agricultural sector. A very experienced Agricultural Consultant who also has practical working experience in various farming roles both in the UK and overseas. Involvement in assisting clients with different means of marketing their produce and in diversification projects. 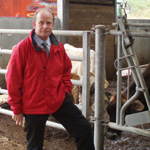 An approved Consultant on the South West Register, a member of Cornwall Branch of the Institute of Agricultural Management, also a member of BIAC and the Kingshay Farming Trust. Mike is able to offer you a wide range of services within his role as a Business Consultant as part of a Chartered Accountancy practice. Mike is a partner in the Haines Watts Rural Business LLP.